Wings notes: Will Z ‘lead’ them back? According to a Hockey News report, it’s already a done deal. 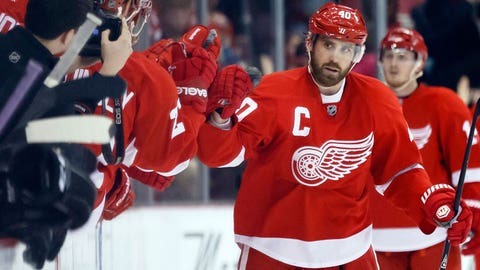 Red Wings captain Henrik Zetterberg has been cleared by doctors and will play in Thursday’s Game 4 against the Boston Bruins at Joe Louis Arena. The Bruins lead the Wings 2-1 in their best-of-seven playoff series. Zetterberg skated on a line with Pavel Datsyuk and Justin Abdelkader during Thursdayâs morning skate. He didn’t speak with the media afterward. The Wings said Zetterberg was to meet with a doctor after the skate and will be a game-time decision. "Z (Zetterberg) told me this morning he was going to the doctor," Wings coach Mike Babcock said. "But because we were even talking about it (him playing), I put him on a line and put him on the power play. "The doctors decide, not me, so I’m hopeful. We’ll know at game time, after warmups." Zetterberg hasn’t played for the Wings since the Olympic break and had back surgery Feb. 21 to remove part of a disc that was irritating a nerve. He has been diligent with his rehab and encouraged by the results. If he plays Thursday, he’ll provide energy and leadership as the Wings find themselves in a must-win situation. "That would be huge," Wings rookie forward Tomas Tatar said. "Z would be a huge impact for us, and maybe he’s the guy who can bring more offense to the team and spread the lines out a little bit more." "I’m not surprised by anything that guy does. He’s unbelievable. He’s a machine. … He’s worked hard to be in this spot for a chance to play tonight." Leadership was the one word all the Wings tossed around when discussing Zetterberg’s possible return. However, it was Babcock who offered clear perspective of what Zetterberg’s presence would bring to the Wings. "I can expect him to provide great leadership both in the room and on the bench," Babcock said. "So if we get nothing else, that’s good enough." If Zetterberg plays, he’ll be on a line with Pavel Datsyuk and Justin Abdelkader. Zetterberg will also play on the first power-play unit, which has struggled recently. Looking to add some size, experience and grit to the lineup, veteran forward Todd Bertuzzi will make his 2014 postseason debut in Thursday. Bertuzzi will replace rookie Tomas Jurco and will be paired with "kids" Riley Sheahan and Tomas Tatar. Taking Jurco out of the lineup wasn’t an easy decision for Babcock. "It was three kids playing together, and it wasn’t going as well I would have liked," Said Babcock. "I didn’t think we spent enough time in the offensive zone with that group, and I’m hoping that one veteran player (Bertuzzi) can help them out. "We’re taking out Jurco, who’s got great speed, plays real well. And why would you do that? "You know what? That’s a good question. I asked myself that 100 times yesterday and then just before I started to fall asleep I was thinking about it again. So I didn’t sleep well. I don’t know. I’m trying to do the right thing." Whether Bertuzzi can provide the spark needed for Sheahan and Tatar to find their game is unknown, but the crafty veteran is looking forward to the opportunity. "I played with them (Sheahan and Tatar) last game in St. Louis," Bertuzzi said. "I’m comfortable with them. I like playing with them. They’re fun, they’re high-tempo, and they hold onto the puck. It’s all about puck possession. "I’m just going to try to create some space for them." Detroit will again be without the services of forward Daniel Alfredsson, who remains sidelined with a nagging back injury. "Alfredsson is feeling better today, and the trainers told me that he should be ready to go by Saturday," Babcock said. "Could I throw him in the game? Probably. He hasn’t practiced in a while and we don’t really know. "We’re trying to put the best lineup that we can on the ice to help us win." In the first two games of the series, Alfredsson had zero points and looked to be laboring a bit out on the ice. A healthy Alfredsson would add another veteran leader to Detroit’s youthful lineup. "We just lost Alfie the last game and we miss him," Tatar said. "That’s the kind of guy who can keep the emotion down, just by saying good stuff in the locker room and supporting you. "We obviously need big leadership, so to have him around in the locker room during the game, it’s a huge thing." Babcock was asked again about the play of scoring forward Johan Franzen, who has one assist and is a plus-1 through three playoff games. "We need him to be a force," Babcock said. "We need him on the inside, and to compete for space at the net front and be a factor. "For us, let’s face it, we counted on our kids to get us in. we really counted on them. We needed them to score. "And we need some other guys to help them out right now while they’re trying to find their way." Especially from Franzen, who’s made a career out of scoring big playoff goals. But in his last 21 games, including the regular season, he has one goal, back on March 27 against Montreal. Detroit has scored only two goals during the first three games of the series against the Bruins, a team known to play stingy defense. "It’s interesting, you’re (the media) talking about scoring goals," Babcock said. "To me, the things that they did better than us was, they played better defense than us. They kept us on the outside, they were quicker, and they skated with us. "We talk about being quicker than them. They were quicker than us the last game, for sure. They were harder and more detailed to play against. We weren’t any of those things, so we need to be good defensively. "If we’re good defensively, we’ll have the puck way more than we did last game."